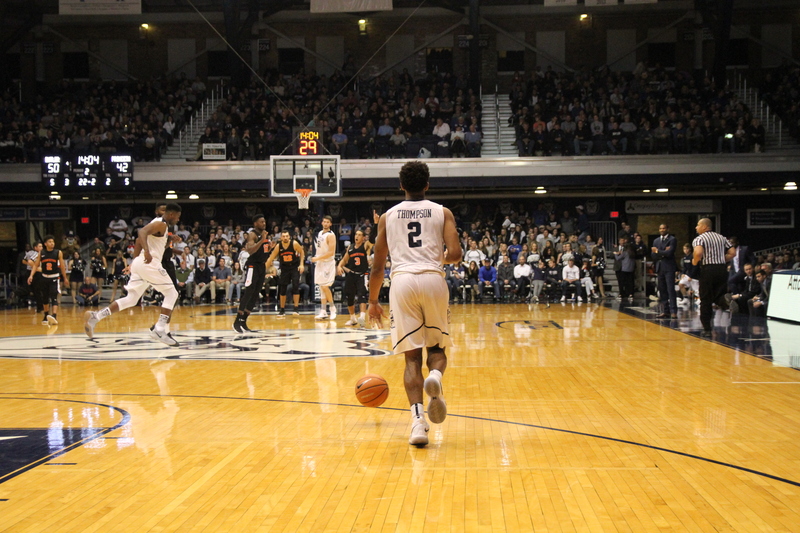 Aaron Thompson takes the ball up the court in a game against Princeton on Nov. 12. Photo by Zach Ballavia/Collegian file photo. Butler basketball took an easy 82-65 win over Furman on Saturday. The win was another non-conference win inside Hinkle Fieldhouse; Butler hasn’t lost a non-conference game in Hinkle since 2012. So the fans are pretty used to celebrating home wins, but that doesn’t mean it gets old. Sean was on 🔥 today. There are very few things Trip will turn down. And a pregame bone is not one of them. What a good pupper. Who doesn’t love a good boy? Who doesn’t love peanut butter and jelly? Former Butler star Tyler Lewis returned to Hinkle as a Furman coach. Still trying to think of a better combination, Arika. Tell ’em how it’s done, Coach Meyer. Big Cat knows how to celebrate a birthday. Day basketball and Hinkle. Name a more iconic duo. We’ll wait.